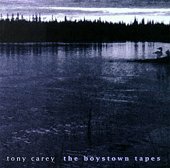 Almost five years after his last release, and fifteen after his last US release, Tony Carey is back with an immensely impressive new disc The Boystown Tapes. Although more mature sounding, fans of Carey's best known earlier works like Some Tough City and Blue Highway will find plenty here to please them as he's not missed a beat since these releases, walking the line between lush atmospheric AOR and rock. Lavishly recorded over an eight year period (and sounding like it, with absolutely superb production) The Boystown Tapes finds all the elements in place, from the deep, often personal, lyrics and his intensely emotional lyrics to the perfectly executed instrumentation, with every instrument (all handled by Carey) playing a vital part to the overall sound of each cut. If you liked Carey's previous work contact the folks at Happy Street and grab a copy of The Boystown Tapes. Fans of Carey's side project Planet P, make sure you check out Carey's website for info on new songs.